Picking a perfect outfit for a bride can be quite tedious. The wedding dress for a bride has to be unique, attractive and more importantly, fulfilling for the bride. Each and every outfit the bride wears has to be captivating and graceful. If you are a bride-to-be racking your brain about the perfect attire for your wedding to walk in and steal the show, look no more! Here are some options for the best traditional wear for you to choose from. The outfit of the main wedding is not the only important one. Pre-Wedding outfits are also as important as the main event itself. Pre-Wedding wear has to be elegant and more subtle in comparison to the main wedding dress so that it doesn’t subdue the main wedding look. Here are a few choices to help you start with. This astute pista green lehenga looks neat and tasteful. Adorned with golden and silver zari works, this subtle lehenga is a good option for a mehendi ceremony and vidai ceremony. 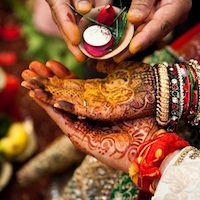 Instead of opting for lehengas in pre-wedding ceremonies, traditional suits are a better option as it diversifies the costumes for the total wedding. This off-white suit looks flawless when matched with a pink dupatta. The suit made of faux georgette is lined with patch border works on the bottom with stone and zari works throughout the body. 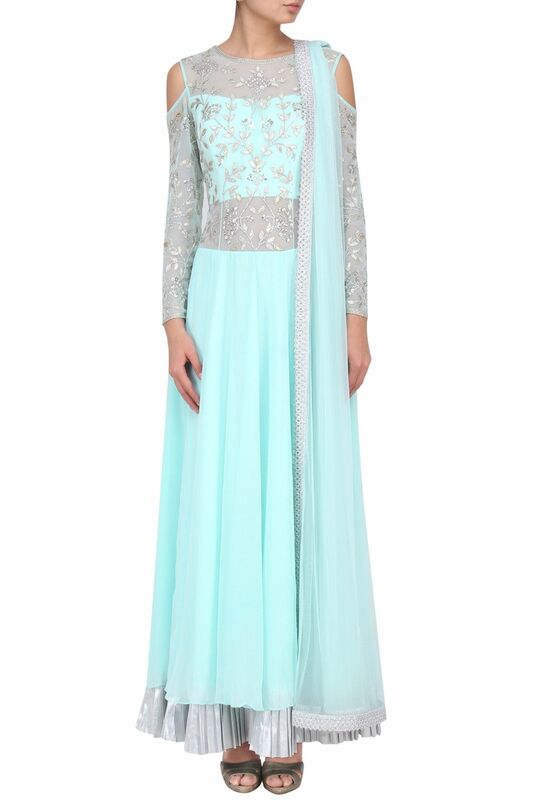 If you are someone who likes to get down on the dance floor and groove to a few beats, Anarkali suits are the best traditional wear for it. The twirls and the circles would look lovely in the Anarkali suits as it creates an illusion of layers during dancing. It is also comfortable and offers a look of poise. This one here with a plain dark blue body, golden stone studded works on the upper half and a red and golden zari works looks ideally the part for a sangeet ceremony. This lehenga looks like it’s straight out of a movie! With georgette top and a sheer pearl neckline, this is just beautiful. For an engagement ceremony, this is the best traditional wear to sizzle in. The attire for the main wedding has to look bold, rich and authentic. This bridal wear has to surpass any other outfit you have ever worn. Bright, dark colors are the best option as it brings out the embroidery, zari and stone works and offers a look of royalness. Here are some options for you to choose from. Weddings happen once in a lifetime, so if you want to splurge on your bridal wear, then go for Sabyasachi’s collection of bridal wear! Sabyasachi’s wedding dresses are a combination of classic, rich, artistic, ravishing and impart a sense of bearing. This maroon lehenga with silver works is just breathtakingly beautiful that it is going to make every bride look like a Queen! The range of Sabyasachi’s collection is, without any doubt, the best traditional wear that one could get to wear on their big day! Kancheepuram sarees are unique, traditional and gorgeous. With the beautiful zari works and the neat fleets, it gives out a vibe of elegance. An extra added uniqueness can be rendered to your saree by adding your favorite photographs on the pallu of the saree to make it your own! With the right amount of jewelry, Kanchipuram sarees will be an alluring outfit to wear at your wedding! Chaniya choli is a stunning outfit to wear at your wedding. The long pleated skirt and the blouse with richly decorated dupatta offers a wide range of options to carry out the look with ease. This one in red, with beautiful embroidery all along the skirt compliments any skin color and is comfortable wear too. Reception wear has to be traditional, yes, but it must also have a sense of stylishness in it. It has to be something which pops out from the crowd and brings out a beautiful look in the photographs. Look through some suggestions for you to choose from. 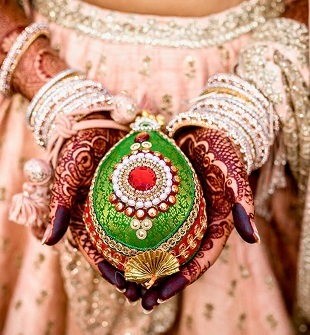 A normal lehenga is something usual in all weddings. To make your outfit different from any other, then you have to look for ways to make it unique. Instead of opting for a sleeveless lehenga, a full-sleeved netted lehenga with exquisite works on the sleeves will be able to add a ‘wow’ factor to your total look! This bridal lehenga from Manish Malhotra’s collection, with netted sleeves, looks amazing and graceful. This fuschia pink lehenga will steal many hearts! Beautifully crafted golden works on the bright pink lehenga look bold and bright. This would make the bride the center of attraction of the whole reception! And this a best opportunity for ladies with toned midriffs to flaunt it in style! Nothing screams rich more than a golden bridal wear! This daring golden lehenga compliments both dusky as well as fair-skinned beauties! It offers an overall shiny look in your presence. With a deep and broad neckline, it offers a wide range of options of trendy neck pieces to chose from, to complete your golden look! 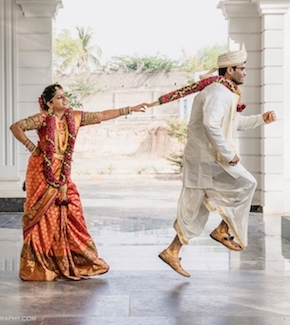 Sizzle at your wedding with these options from the best traditional wear of all-time! Do comment your favorites from the list and share it if you like with the other brides-to-be to help them get a perfect look in their weddings. An enthusiastic reader who gets excited by the craft of words. A frequent blogger, who loves to churn in words. A passionate writer who loves playing with words.